If you like in the snow belt, chances are you put your dirt bike away months ago to wait out the winter, but maybe you don't have to. 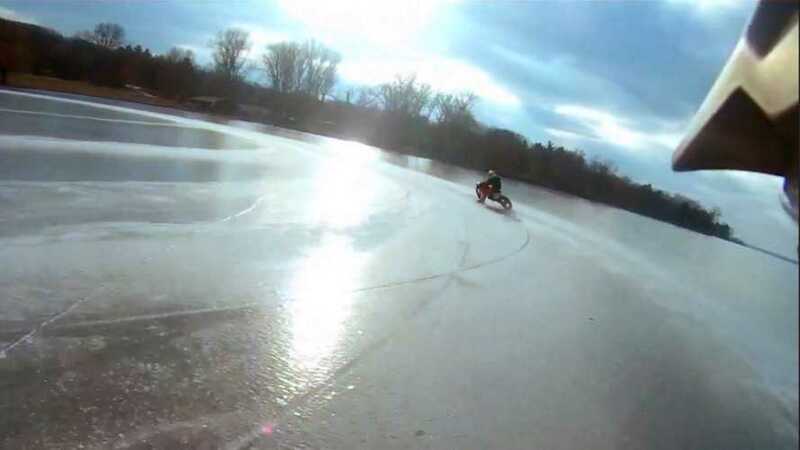 We recently found this video of a couple of guys having a blast riding their summer off-road bikes on a frozen lake, after mounting up spiked tires specifically designed for ice. Redditor "solitudechirs" posted the helmet cam footage of his antics on the frozen surface of Lake Wisconsin and Lake Winnebago. Those used to driving fast in rear-engined cars will understand the technique, because the most important thing on the ice is to stay on the throttle. Quoting from the original poster "It's a totally different kind of riding, especially with good tires... with properly built, good condition tires, you have more grip than you know what to do with, as long as you're on the gas. As soon as you let off though, the rear suspension/tire is unloaded and ready to slide around." If you don't mind the cold, and love getting sideways, ice riding may be just the winter hobby you are looking for. We've recently run stories about winterizing your bike if you aren't going to ride it, and conversely, converting it into a snow bike, but this seems more fun, and less expensive. Why buy a snowmobile, when a couple of tires can make any motorcycle into a four season, all surface fun-mobile? If you consider the cost of a lift ticket, not to mention all the equipment, compared to a weekend skiing a pair of ice tires looks like a total bargain. So bundle up, be sure to wear some armor (ice is a lot harder than dirt), and find yourself a local lake that freezes good and solid, and isn't overrun with kids playing hockey.